Check out the Venetian website for some great spring specials including suites at $139. The Venetian and her new twin tower, the Palazzo Las Vegas, offer one of the most elegate venues on the strip and at the special rates make for a great bargain this spring in Las Vegas. Trump Tower is also now open though I don't have details yet on rates or specials there. The Island of Macau has gone from a sleepy Portuguese colonial enclave to one of the world´s top gaming and resort casino destinations. Huge investment in the Cotai strip by American gaming empires Wynn, MGM, and the Venetian are almost certain to define this area very near Hong Kong´s bustling metropolis as the new Las Vegas of the Orient. 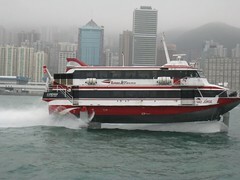 High speed hydrofoils take people from Hong Kong to Macau - I think every 30 minutes though reservations may be required for the trip.